I kicked off Restaurant Week (back on Tuesday, January 22nd) with lunch with my three girl friends: Giulia, Seungmi, and Helen, at Devi. 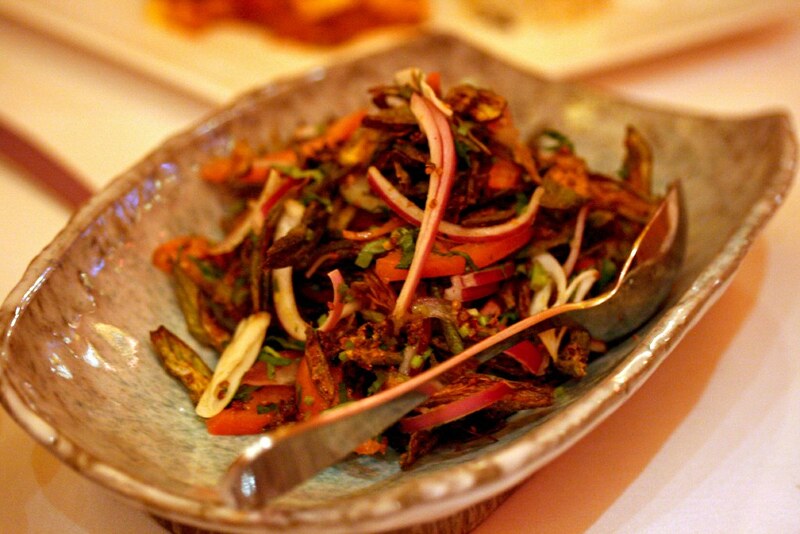 Yep, we’re exploring into realm of haute Indian cuisine since what we’ve encounter in our pasts were heavy, greasy, fire breathing-spicy Indian food. We had high hopes for this place since I’ve heard a lot about it on Chowhound. And yes, I do acknowledge the fact that they do serve a prix fixe lunch on a normal basis but we craved Indian food. 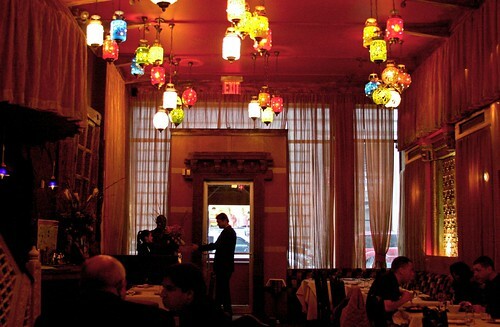 We all went into this moderately dim restaurant with cool lamps strewn at the front of the dining room with accents of Asian eclectic furnishings. Not kitschy like some ethnic restaurants would decorate. We were escorted toward the back of the restaurant, not too far from the kitchen since we see many chefs go back and forth right behind the wall just mere feet away from our table. Once we settled in, we perused the Devi Winter RW ‘08 Lunch Menu and ordered our food. 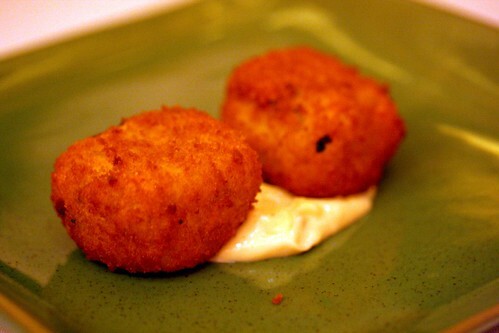 Giulia had Mom’s bread roll fritters since she loves bread and it’s interesting how they would fry bread and stuff it. When I tasted a bite, it was intriguing – the bread’s soft with bits of potato and the cilantro, chili, and garam masala flavors moderately permeated my palate. 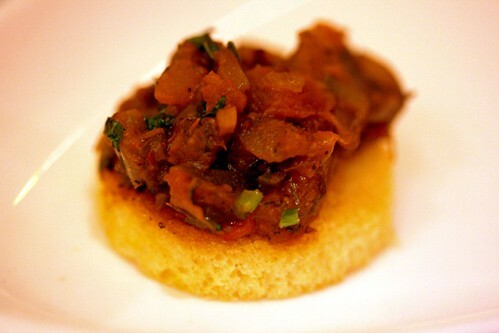 The tomato sauce that accompanied the bread fritter was tasty, too – a hint of sweet-tart flavor. 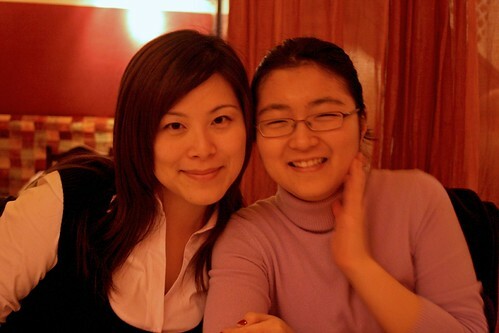 Helen and Seungmi ordered the salmon and crab croquettes. 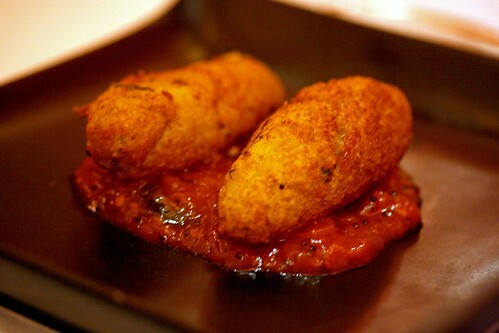 These croquettes are not the typical stuff you would get in a Spanish tapas bar; they’re denser and packed with a ton of meat (or I should say seafood). The aren’t very crisp but the salmon and crab meat were very moist and tender. 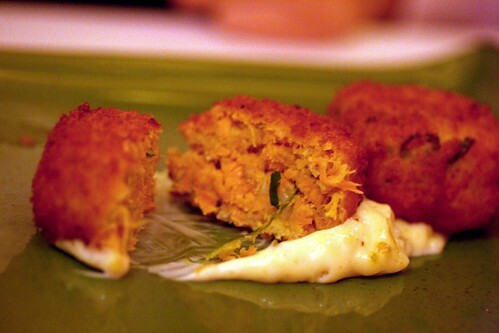 The pickled green chile mayonnaise was a tasty condiment to go with the croquette, that Helen doesn’t mind smearing every last drop off her plate. I got myself the Manchurian cauliflower since I remember reading on Chowhound that it’s considered the signature dish or at least it’s one of the highly recommended dishes to get here. And they didn’t steer me wrong; the cauliflower ROCKED! The spicy garlic-infused tomato sauce was delicious with the fried, sweet cauliflower. I think it’s the sauce that won me over – it’s sweet, spicy but not a throat burning scorcher, and it’s garlic-y. What was really unexpected was the fact that our servers brought out these two extra dishes to our table. And they said, “They’re compliments from the chef.” This struck us as odd since we haven’t complained about anything and I don’t know the chef, yet we’re being treated pretty well already. 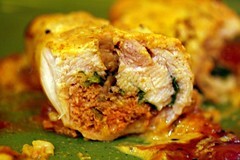 The lamb-stuffed chicken was an intriguing take with a chicken dish. The lamb was moist and tender with hints of cumin, fennel, and cilantro, while the chicken wasn’t dry at all. The sauce that accompanied this dish was delicious as well – sweet, tart and savory all at the same time. The mushroom toasts were basically toast rounds topped with finely chopped mushrooms, flavored with cilantro and other spices that I don’t really know (since I’m not too familiar with Indian cuisine). What appealed to me was the dainty size of these toasts that I thought it’s adorable. 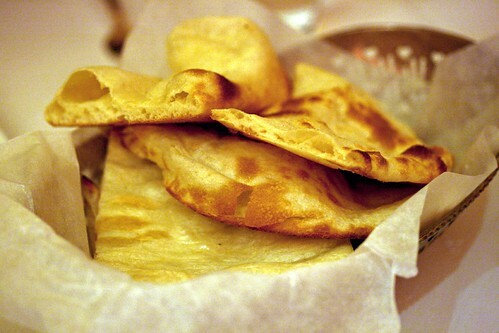 When the server brought out the basket of naan, my first instinct was to touch it to feel if it’s warm. And it was! This elicited peals of giddiness from us, especially me since I am easily swooned with fresh bread of any type. Then the servers also brought out another dish on the house, a large platter of fried okra salad. Honestly, this is the first time I’ve ever tried okra. Since it’s fried, I don’t see any reason why I should not like it – I do like the fats. Anyways, the okra’s really crispy and with the red onions and juicy tomato gave it some texture complexity; while my tongue was sensing a lot of coriander and cumin beyond those vegetables (and fruit from the tomato). Giulia’s goat cheese pesto-stuffed chicken was yummy. What really enticed her to order it was due to her love of goat cheese. Yeah, goat cheese is awesome… Moving on, the chicken was a tad drier than I would like it to be but I like the flavor components of the soft tangy, creamy goat cheese with the herbal kick from the pesto. 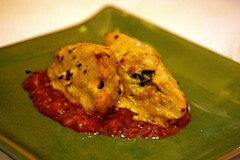 Helen’s Bombay-style tandoori halibut was cooked perfectly. 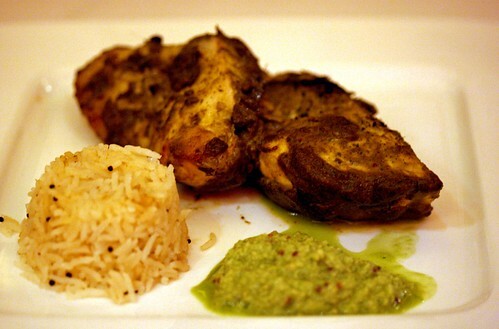 The halibut was moist and flavorful from the mint-cilantro chutney marinade. It’s mildly spicy and I loved the coconut sauce on the side of her fish. It’s nutty and creamy that cools down the heat factor by a notch. Seungmi’s paneer stir-fry was something we haven’t really tried or know since I personally never tried it. When she ordered this, she asked the waiter, “What is paneer?” What he defined it as, “Something that tastes like fresh tofu.” When we all got to try it, it does tastes like tofu even though it’s technically not. It’s slightly sweet and spicy with the mixture of peppers, onions, and cilantro. It almost tastes like a stir-fry that my parents could make at home though sans the cilantro. But tasty nevertheless. 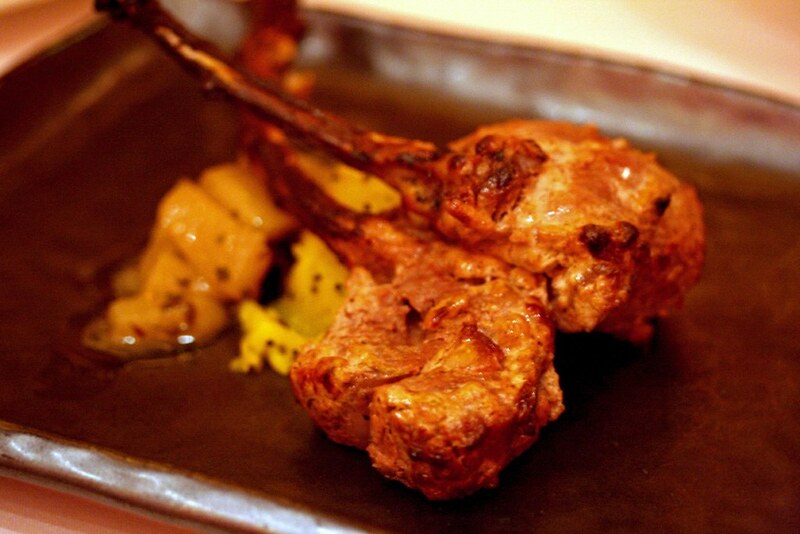 Then we finally come to my tandoor grilled lamb chops. This was a fantastic lamb dish. 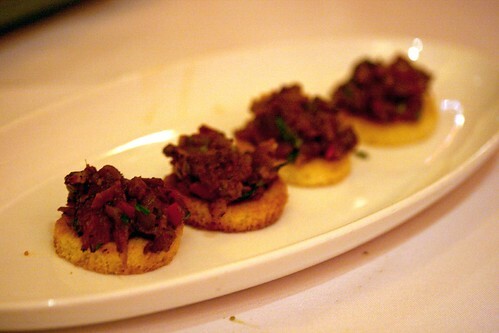 The lamb was cooked perfectly to a medium-rare; soft, tender and juicy, not at all gamy in terms with flavor. I really enjoyed the sweet and sour pear chutney the most (same with Giulia) since the pear wasn’t mushy and it had the right balance of sweet, tart and spicy. The spiced potatoes were fine – it’s mashed potatoes flavored with cumin, curry and cilantro. Despite the fact that all of us are sitting back on our chairs, trying our hardest to have room for dessert, we felt really full. But we must eat dessert. No dessert means (in my world) that the meal isn’t completely done. So we went on full steam ahead and ordered. Everyone but Giulia ordered the kulfi which is an Indian ice cream, with candied pistachio, some kind of yellow noodle (which I don’t remember its name) and citrus soup. I was expecting the ice cream to be soft but this is not the typical ice cream that we’re all familiar of – it’s chewier. It’s a bit too cold that we’re all struggling to dig in with our spoons but it’s a dessert that I enjoy eating since it’s not too sweet and it’s delicately nutty flavored. 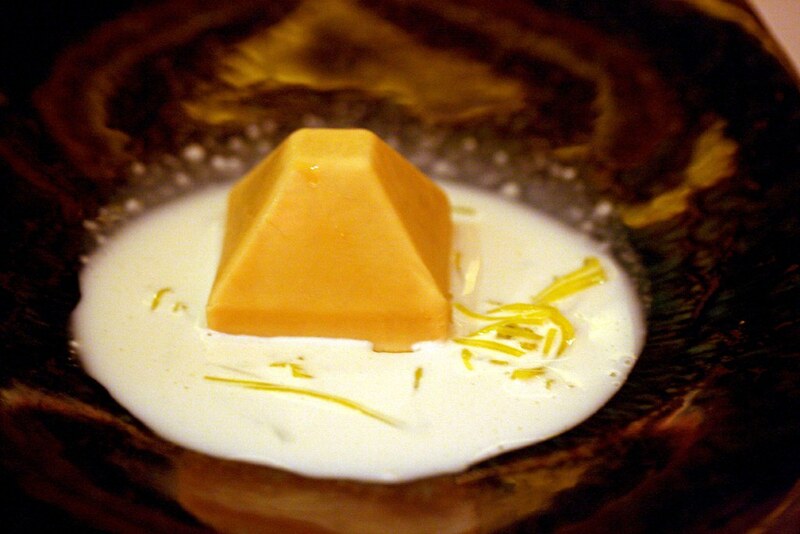 The soup didn’t taste citrusy even though the menu indicated it is – it’s a sweet, milky soup. 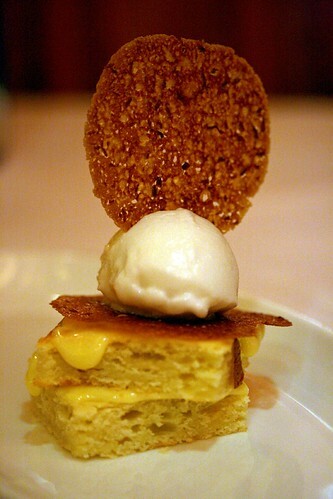 Then we go to Giulia’s dessert, the lemon trio: lemon cake, lemon-lemongrass sorbet, and lemon curd. When I had a small bite of her dessert, it’s quite refreshing as a pleasantly, acidic, sweet palate cleanser to the end of the meal. The cake was just moist enough with the curd to give a hint of lemon flavor, and the sorbet was creamy and smooth. It’s a lovely simple dessert. We asked for the check and we walked outside. The strange thing to note was that while all of us were waiting for Seungmi to get out of the restaurant, we met one of the chef-owners of Devi, Suvir Saran and shook hands with me since he asked nicely which one of us was with the camera. (Jeebus, I’m getting attention without trying…) He inquired us how if we enjoyed the meal (which we did and they exceeded everything in terms of food and attentive service) and chatted briefly, and said our goodbyes. He went into his restaurant while we all wandered around Union Square window shopping. 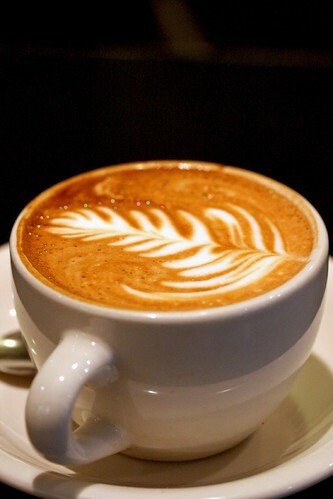 That’s until I had an espresso craving, which Giulia won’t mind having some as well. 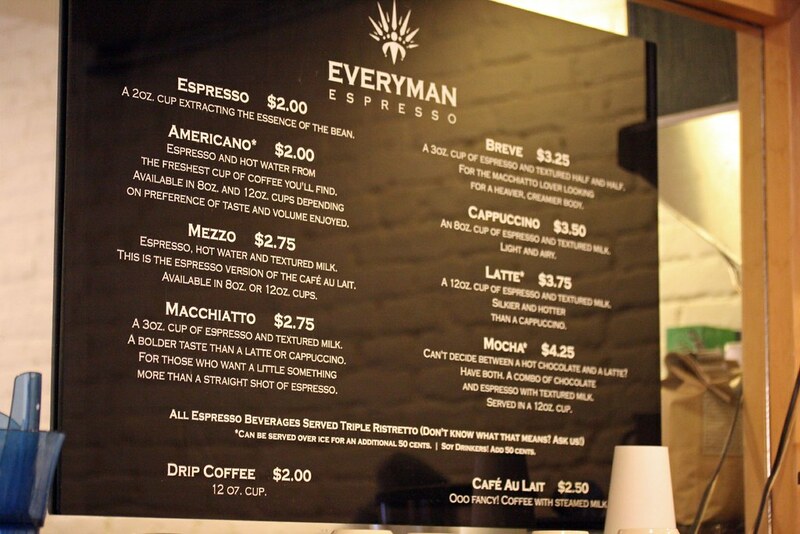 We all then walked over to Everyman Espresso (which used to be Ninth Street Espresso) since I haven’t been there since they changed owners. 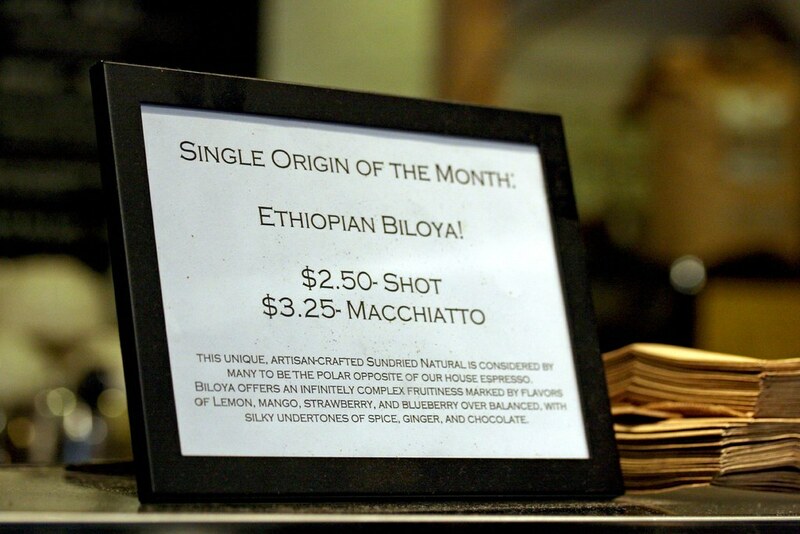 Giulia did order an espresso shot of the singe origin of the month, the Ethiopian Biloya, while I ordered the cappuccino. Despite the fact I forgot to take a photo of Giulia’s espresso, I took a tiny sip from her demitasse cup. It’s very strong and bold; initially I got the lush berry flavor then it peaked to a strong acerbic flavor and then dissipated to a nutty and almost chocolatey aftertaste. Me likey. My cappuccino was quite good but not exactly as complex as the straight up espresso Giulia had. The cappuccino was bold and silky with nutty undertones that’s slightly muted with the creamy milk foam that topped this drink. I liked it a lot. This wrapped up our afternoon of delicious Indian fare, espresso drinks, and a great time with friends who I haven’t seen in ages. Hopefully, tomorrow or by this weekend I’ll post up my Restaurant Week lunch at Cafe Boulud – which I think a lot of you have seen my Flickr photos already on the sidebar. Oh man your post made my mouth water. 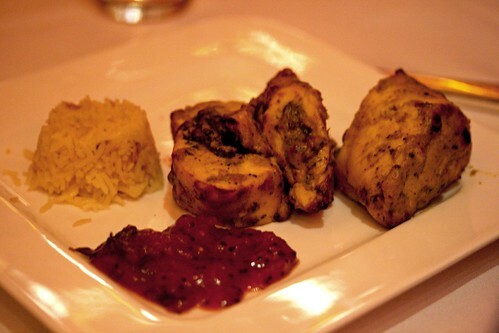 I had lunch at Devi awhile back and had the manchurian cauliflower and the lamb chops – both rocked my socks. John: Ah, thanks! :) Devi’s cauliflower and lamb chops are ridiculously delicious. I wish I could eat that once a week…except my parents aren’t too fond of lamb for some reason so I can’t cook it at home. but the food was amazing! i loved it! and when i went home i finished the chicken ^^ it was really good. Paneer is actually cheese; though, that’s pretty hard to discern since, as you noted, it has the consistency of tofu. This place looks awesome, though! Must try it out one day. 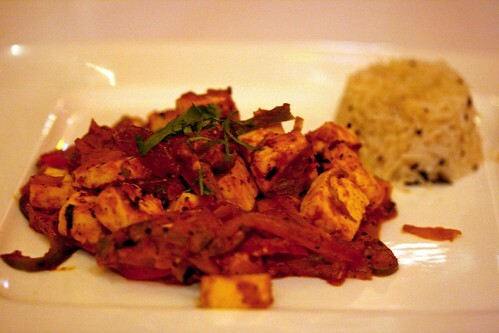 Jennifer: Oh, I know paneer is cheese…after I looked it up at home. The yellow noodly thing is called sewai, semolina noodles, I think. Manchurian Cauliflower is killer funny, Punjabi Chinese. Paneer is cottage cheese. Srin: I thought those yellow noodle stuff was a semolina pasta-like thingy. Thanks for the info! The food looks great and the interior of the restaurant gives a really warm feel. It’s a pity NY is so far away! Wow the food looks really good. Very fresh too.